I was lucky enough to spend my last afternoon in Alaska driving to Talkeetna with Aliza Sherman who lives in Alaska who I’ve known since 1995 and with Cassandra Stalzer my host! I love the framework she created for identifying and cultivating Super Fans on Facebook. I like to call it the ladder of love! The very first step is getting attention and getting people to “like” or join your Facebook page. There are many creative ways to promote your Facebook page to promote your page to your target audience and get them join or like. Here’s an example from the Food Bank of Monterey County, a Lucile and David Packard Grantee that I’m coaching this year. They launched their page slowly and had about 100 fans. Earlier this week, TysonFood Hunger Relief blog offered to donate 100 pounds of food product for every “like” on their page. They’ve increased their fan base by 4 times or over 400 now – and the odds are good that there will be a truckload of food delivered to the Food Bank on October 4th. What’s nice about this approach is that it isn’t a contest and the only “winners” are the people who are served by the Food Bank. Don’t forget about the importance of the Facebook feed. Fans won’t visit your page,but they may see your news in their news feed. Getting people to like or comment on your Facebook content improves the chances that more people will see it in their feed, an algorithm referred to as “EdgeRank.” TechCrunch goes into more detail about Facebook’s EdgeRank here. But to bring your fans higher up on the ladder of love – to loyality, leadership, and evangelism – takes consistent engagement and relationship building. When I was in Alaska, I asked Mary D Barber what nonprofit did the best job of engaging its audience on Facebook consistently? She pointed to the Anchorage Concert Association. When I examined their page, I noticed they engage with audience before, during, and after shows. What I found later after interviewing their Executive Director, Jason Hodges, is that before each show begins they make an announcement from the stage. They ask patrons to pull out their smart phones, take a photo of the person sitting next to them, and post on their Facebook page. Then they ask them to shut the smart phones off. 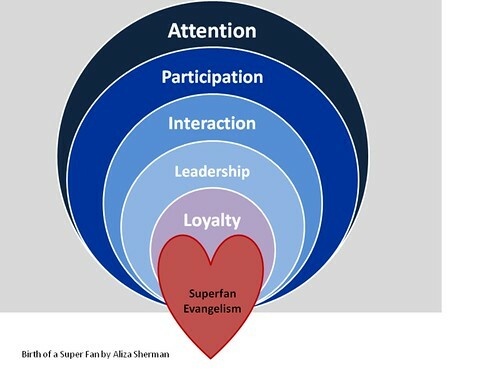 Once you have this level of consistent engagement, you will begin to see leadership and loyality and be ready to reach out to those emerging super fans who will become your evangelists and spread their love for your mission all over the social web. How have you used the “ladder of love” to plot your Facebook or social media strategy? Great advice, Beth (as usual). Thanks for the shoutout. I _love_ the tactic from the Anchorage Concert Association. Turns the sometimes-nagging “please turn your phone off” reminder into fun, viral activity. Really creative. I too like that tip about the cell phones. I’m going to share this post with my co-workers. I like the steps above, but the image gives the impression that loyalty doesn’t start until after leadership. I think we all realize that’s not true. I can be loyal to a cause or a product and never reach the final step. In fact, only a small percentage of people will. I’m loyal to a lot of brands, both consumer goods and causes. But I prefer not to have a relationship with them. A very few, yes. Now here’s where this post resonates with me. The majority of the very few brands I do want to engage with me have a poor social media strategy. Yes, you have a Facebook page, but rarely do you attempt to engage me in conversation, rather all you do is post announcements. You fail to offer a reason to keep me engaged. So, while I may be one of your followers, I’m not deriving much benefit from your social media presence. That inhibits my willingness to spread the good word about you. I read a dozen or so blogs every morning. For your blog or Facebook page to make the cut, you must offer me something of value. A fun contest to participate in, a nugget of knowledge about your brand that educates me and is easy for me to pass along. Perhaps, depending on your brand, it makes my community a better place. It’s that “Discussion” tab on Facebook. How active are your discussions? That’s where you get the evangelists engaged. Ask me for feedback about a strategy, the name of a new product, or a t-shirt design. Push beyond the announcements and generate multi-voice conversations and show us how your brand benefits from our participation. Beth – I’m curious. How do recommend that Page admins identify a superfan? By amount / quality of engagement? Once they are identified, what are you recommendations for nurturing that relationship further? I love the idea of taking a photo of the person sitting next to you and posting it to facebook. I used to work for the Chicago Symphony Orchestra and I’m going to share this tip with them. A unique, attention grabbing activity like this would also probably help the unfortunate event of someone forgetting to silence their phone. The ladder of love is a great visualization. I think there is a lot of undefined gray area between interaction and participation. I look at a “like” as a great step in verifying the content I’m posting is interesting – but it isn’t until I see comments that I can see participation not just between the page and the admin/org but between fans themselves. This is an important step in the process/strategy for us. Wall Conversation is a great way to identify interests of different users and a perfect time for the admin to jump in, ask questions or just say thank you for engaging. Definitely appreciate the aikido move with the cellphones in the concerts – brilliant. I, too, am interested in John’s question about the factors for IDing the Superfan. Any chance you’ll respond with a follow-up post? Also, Jason mentions the difficulty in linking the sm strategy with ticket sales and the quantification of ROI. Any more insight on that front? Thanks (as always) for your work. I think it is a two step process. the first pass is to capture the names of people who are liking and commenting. some social media management software does this really nicely. then the second step is to get to know these people and come up with a proposal for them to amplify and spread your org’s mission. I’ve found that SocialReport.com does a good job with these types of reporting. Because most people are not doctors on our page, I always have an issue looking for things written in simple terms. Thanks for this post and for providing great examples to colour this Ladder of Love! I’ve been trying to engage with our supporters on Facebook, asking them questions every now and then and sharing photos/videos from our work overseas. So far though our response has been lacklustre…a few ‘likes’ here and there but it’s rare for someone to take the time to comment. I guess it’s just a matter of finding what appeals most to our audience and this is something we need to continue refining. Enjoyed reading Glenn’s comment as well about creating value and a reason to participate. Need to get more creative with our messaging! You had me at “creative ways” to promote your Facebook page, but I literally said “wow!” out loud when I read about the cell phone/concert idea. Great idea! I think all of us who have performance or public gatherings could utilize this idea to our advantage. Thank you for this post on the Ladder of Love! Your by no means to old to start your Martial Arts Training, nonetheless you do have to keep in mind at our age the body takes longer to recoup.